Mideast: A Rerun Or New Era? CBS News Reporter Charles Wolfson is a former Tel Aviv bureau chief for CBS News, and now covers the State Department. "The more things change, the more they remain the same" may be too simplistic, but the old saying absolutely rings true when it comes to the conflict between Israel and its Arab neighbors. Israel unilaterally withdrew its settlers and army from Gaza a year ago. Now, as the result of the kidnapping of an Israeli soldier by Hamas, the IDF (Israel Defense Forces) has re-entered Gaza. Similarly, after the two other IDF soldiers were kidnapped in Northern Israel by Hezbollah and taken back across the border to Lebanon, the IDF swiftly and predictably followed and is now back in Lebanon, looking for their missing soldiers. It obviously didn't matter that Israel occupied the Southern part of Lebanon for most of two decades before pulling out six years ago. Now they are back with artillery shells, bombs and naval blockades and there is still more loss of life: civilian and military, Israeli and Lebanese. Why now? Since Hamas won control of the Palestinian Authority in a democratic election in January, it has been on a collision course with both Israel and the United States, neither of whom will talk to its leaders because Hamas is designated a terrorist organization by both. To make matters worse, it has become clear Hamas' political leaders do not always control its military wings. More than two weeks later, Israel has yet to get its soldier back from Gaza and hundreds in Gaza are dead or wounded. 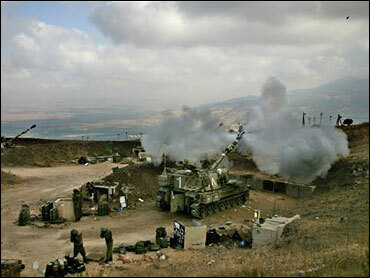 Meanwhile, Hezbollah, not to be outdone by a rival terrorist organization, opened a second front for Israel to defend. Israel's response has not been confined to the southern part of the country which Hezbollah normally operates in, but has spread to the bombing of Beirut's airport and the blockading of its port. The key to Hezbollah's operations lies elsewhere, however. State Department spokesman Sean McCormack said, "Hezbollah, essentially, you know, are terror subcontractors for Damascus and Tehran." And in Jerusalem, Israeli Foreign Ministry spokesman Mark Regev told CBS News, "We are concerned that the two soldiers being held in Lebanon could be moved to a third country, could be moved to Iran." Why would Hezbollah act so boldly now? Take a look at the considerable international pressure Tehran is under to abandon its nuclear weapons program, and it is not surprising they would like to divert attention by putting the spotlight somewhere else. Jon Alterman, a Middle East analyst at The Center for Strategic and International Studies, puts it this way: "The Iranians, who support them, could not be disappointed" by Hezbollah's actions, but adds, "That is not to say (this specific action) is Iran-directed." In the escalating Lebanese crisis the Bush administration is finding itself caught between two competing policies. Strong support for Israel and its right to defend itself is now pitted against Washington's support for Lebanese Prime Minister Fuad Sinoira's fledgling democratic government. The democracy agenda is very important to President Bush and his secretary of state, Condoleezza Rice, but, to the extent Israel's military causes death and destruction in Lebanon, the future of Sinoira's government may become a casualty of Hezbollah's latest action. Traveling in Germany, Mr. Bush said, "Whatever Israel does should not weaken…the government in Lebanon." Finally, world leaders might have to take a step back and see if the current crisis is also the turning of a new page in how the Arab-Israeli conflict is being waged. For the most part, over the past half-century, the conflict has been a state-to-state matter. Israel has fought Egyptian, Jordanian and Syrian armies. Yes, it has also fought with Palestinians who didn't have a state (and still do not have one) but, by and large, its opposition had an address. The CSIS' Alterman points out, "Here, with Hamas in Gaza and Hezbollah in Lebanon, they are dealing with a non-state conflict. Who is the Israeli government going to fight against?," Alterman asks. Yes, Hezbollah and Hamas may get support from Tehran and Damascus, but will Israel's newly-elected Prime minister, Ehud Olmert, choose to take the fight there? For now, the clashes are confined to Gaza and Lebanon and, although very serious, are somewhat contained.